The corresponding author should submit the manuscript to the system without author name(s)to facilitate the double-blind reviewing process. At the submission stage, author information should be entered only in the initial electronic form. After acceptance, author information should be added to the final version of the manuscript. Is the manuscript typeset on A4 paper with top margin 3.00 cm, bottom margin 2.75 cm, left and right margins 1.75 cm, left gutter position with 0 cm gutter, header 1.75 cm, footer 1.5 cm from the sides, different first and even-odd pages? Is the manuscript typeset in Arial? Are the paragraph options set up as follows? Spacing: Before 0 pt, After 6 pt; Line spacing: At least at 13 pt? Are page numbers aligned to the right on odd pages and to the left on even pages and written in 11 pt Arial? On the first page of the manuscript, are the year, volume, issue number, page numbers, and the ISSN numbers written as header, right aligned and in 8 pt? Starting with the second page, is the original title written left aligned on even pages and the author(s) information written right aligned on odd pages as header in 8 pt with underline? Is “Original article (Orijinal araştırma)” written on top of the title left aligned in 12 pt bold italic? Is the title of the article in English written in 14 pt (bold) and centered? Is the title in Turkish written in 12 pt (not bold) centered? Are the titles written with only the first word capitalized? Are author names given as Name SURNAME1* Name SURNAME2 not separated with a comma, 12 pt (bold) centered and numbered as footnote (by choosing References/Insert Footnote)? Are full addresses of authors, corresponding author’s e-mail and received and accepted dates written in the footnote? Are all author names numbered? Is institution information given in the footnote for each number? Is corresponding author indicated by placing an asterisk after the number? Are Abstract and Öz titles written in 12 pt bold and centered, text body in 9 pt normal? Are Abstract and Öz sections not exceeding 200 words each? Are Keywords and Anahtar sözcükler entered as title 9 pt, bold, left aligned, at most five keywords, hanging 1 cm, justified? All Keywords should be placed in alphabetical order. Do Abstract, Öz, Keywords and Anahtar sözcükler fit the first page? Thesis, project, report information (if any available) given in the footnote in the first page written with only first word capitalized? All footnotes should be 8 pt, normal, left aligned and should not end with full stop. Are section titles such as Introduction, Material and Method, Research Results and Discussion written in 12 pt, bold, with 1 cm indentation in the first line, and justified? Are subsection titles written in 10 pt, bold, with 1 cm indentation in the first line, and justified? Is the body text written in 10 pt, normal, with 1 cm indentation in the first line, and justified? Are figure captions written in 8 pt, normal, hanging 1 cm, single line spacing, and justified? (It must end with full stop) Is the text in the figures written in 8 pt normal? Figures must be inserted as pictures in the Word file. If there are more than one picture/photograph/figure/graph and if these are named as a,b,c... these figures first should be inserted in a Power Point (PP) file side by side (on top of each other) and named there. Later, all of these must be selected and grouped and then must be inserted in the Word file as a picture. If the size of the picture should be adjusted, this must be done in the PP file and moved back to the Word file. Is the top row of every table typeset 8 pt, normal, hanging 1 cm, with single line spacing, and justified? (No full stop at the end) Are texts within the tables written in 8 pt normal and left aligned, and the numbers normal and right aligned? Headings can be centered when necessary. Are decimal points in decimal numbers in the table aligned? No vertical lines in table! To avoid repetitions, is the data presented either as a table or a figure (but not both) in a way that is best understood by the reader? • For up-to-date names of taxon, author, year, order and family information www.faunaeur.org must be used. • Scientific names should be bold and italic in section and subsection titles, and should be italic only in body text. 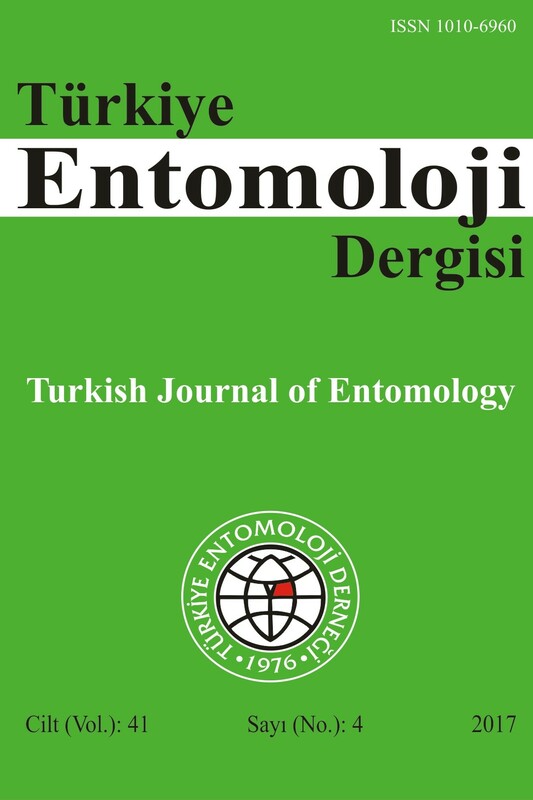 • Scientific names must be written in full as Genus species, Author (Order: Family) in the main title, summary, özet, subsection titles, and where they appear for the first time in body text. • When scientific names are repeated in the text, genus name should be shortened; but if a paragraph or a sentence starts with a species name or in captions it should be written as Genus species (without Author, Order, Family) without shortening. • When giving Material examined in articles which include systematic and taxonomic research results: In alphabetical order, the city (not boldface) then, again in alphabetical order, counties, heights or coordinates, date and individual numbers with respect to the gender. If citations are given in the text and at the end of a sentence they should be given as "(Surname, Year). ", starting with the oldest reference, the ones published in the same year given in alphabetical order, each separated by a ";". If citations are given at the beginning or in the middle of the text it should be written as “Surname (Year)”. Two authors: Surname & Surname, Year. More than two authors: Surname1 et al., Year. Institutions (EPA, FAO, etc. ): All Capital Letters, Year. “References” section title should be 12 pt, bold, hanging 1 cm, text should 9 pt, normal, hanging 1 cm, justified. “References” should be written in alphabetical order and end with “.”. For single author: Surname, N., Year. Two authors: Surname, N1. & N2. Surname, Year. More than two authors: Surname1, N1., N2. Surname2, N3. Surname3 & N4. Surname4, Year. Authors, Year. Title (Each Word Is Capitalized). Publisher and City of Publication, Number of pages pp. Authors, Year. “Title of the Chapter in Volume, (Each Word Is Capitalized), page range”. In: Title of the Book (Ed. Editors N. Surname). Publisher and City of Publication, Number of pages pp. Authors, Year. Title (Only the first word is capitalized). Full name of the journal (not boldface), Volume (Issue): page interval. Authors, Year. “Title (Only the first word is capitalized), page interval”. Name of the Congress/Symposium (Date, Location), Publisher (if exists), total pages pp. Authors, Year. Title (Each Word Is Capitalized). Institution, (Unpublished) MSc/PhD Thesis, City, pages pp. Authors, Year. Title (Only the first word is capitalized). (Web address: http://www.....), (Date accessed: Month Year). Authors, Year. Title (Only the first word is capitalized). Full name of the journal (not boldface), Volume (Issue): pages. Abstracted in......, Year: Abstract No:.